If you are planning to have dental implants, it is important to know what types exist and which one would suit your situation best. There are more than 40 different types of implants available today. You can classify them in different ways such as micro and mini implants. When you visit your dentist, you should be able to discuss your special needs and have him come up with a solution that suits you best. From single to multi-tooth implants and over-dentures, let’s look at the options you have when undergoing implant treatment. 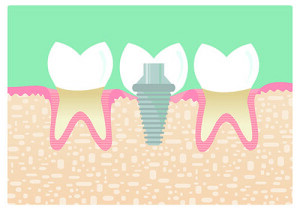 A dental implant can be used to replace a single missing tooth. Some years back, people used crowns and bridges to replace a missing tooth. However, implants provide a long-term solution that doesn’t expose the adjacent teeth to decay. Good thing with using a dental implant to replace a single missing tooth is that it doesn’t lead to further damage that will soon require additional dental work. In this case, the dentist will model an implant that mimics your natural teeth and once it is placed, it allows you to eat and function just like you should. This type of dental implant is also used to replace a single missing tooth. One of the main advantages of using a mini dental implant is that it is a relatively low cost procedure. The major drawback is that it’s not a permanent solution to replacing a lost tooth. In the long run, you can end up spending more money as you will need to repair or replace the tooth. These mini implants are cheaper because they are not made using the high quality medical grade titanium that is normally used in implant treatment. Hence, they do not facilitate proper bone integration. This type of dental implant is designed to help replace sets of missing teeth on the lower or upper jaw. With this type of implant, four implants are placed in the jaw in order to offer the best support and reduce the need for bone grafting. This procedure is complex and needs to be done by a qualified dental expert. The all-on-4 dental implants are very durable and can last a lifetime with proper care. Your dentist can recommend this if you are missing lots of teeth on the upper or lower jaw. Dental implants can be done in a day depending on the type and the patient’s condition. The procedure involves carrying out some examinations such as a physical check, x-rays and CT scans in order to review the current state of the teeth and gums before placing the implants. A CT scan is used to generate a 3D model of your jaws so that the implants will be designed precisely to fit you. The best thing about implants is that they don’t have a lengthy recovery process. You can step out of the dental clinic with a bright smile and without losing your teeth function.